Alight at Xincheng or Hualien train station, take the Taroko anywhere bus or Hualien bus to Tienhsiang station. Take the taxi from Hualien airport (approximately 1000-1200NTD for one-way trip); or take the bus: walk to 085 army hospital, and catch the Tienhsiang bus (4 buses per day). 2. Approximately forty minutes from Xincheng train station. Approximately 800-1000NTD for one-way trip. 1. 1700-2500NTD/car (4-8 people) for half-day. 2. 2000-4000NTD/car (4-8 people) for one day. 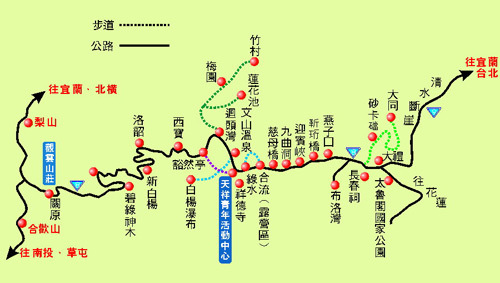 Click to see attractions around the Tienhsiang center.